PondBiotix10 - 30 LB - SHIPS FREE! 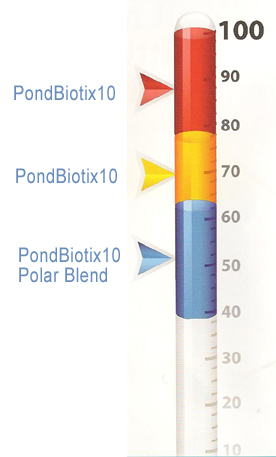 PondBiotix10 uses a patented formulation of select biological species and catalyzing enzymes along with 23 essential vitamins and minerals and biostimulants to create a pond treatment system that is unmatched in performance. PB10 contains extremely high bacterial concentrations (10x) compared to most beneficial bacteria products in the pond treatment market. This makes PB10 a powerful pond cleaning machine and one that can help reduce and eliminate many unwanted growths and conditions in your pond. And if you have sludge and muck at the bottom, PB10 will help to greatly reduce this as well....and PB10 can be combined with our PondBiotixME (The Muck Eliminator) (found below) for even greater muck and sludge reduction. Available in 1/2 lb (8oz) water soluable bags, PB10 is easy to apply to your pond. Simply distribute the packets evenly around your pond at the recommended dosage rates found below. PB10 works best in water temperatures above 65 degrees F. For water temperatures below 65 degrees use our Polar Blend Formula. *This product works best with proper and adequate aeration in your pond. *Free shipping is available in the continental U.S. only. Additional charges will be applied when shipping to Alaska and Hawaii. * Use our pond calculator to calculate the acre-feet of your pond. I'll be the first to admit I wasn't sure about this pond bacteria or if it would help our pond but it's done quite a bit to improve the appearance in the first month and a half of use. The water is clearer and some of the algae has reduced and continues a bit more each day. Things are clearing up! It's been hot here lately and usually that's when the growth get's really bad, but it's improved despite this so we're pretty pleased so far.